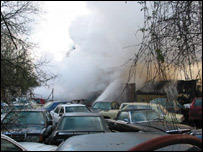 More than 600 people have been moved from buildings near a fire at a workshop, amid fears of an explosion. A 200m exclusion zone has been set up around the site of the blaze in Southend Road, Billericay, which houses both acetylene and oxygen cylinders. 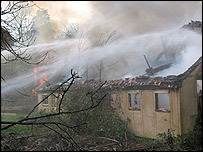 The workshop measures 65ft (20m) by 98ft (30m) and was described by a spokesman as being "well alight". He said the exclusion zone was in place because of the "huge potential for heated cylinders to explode". Essex Police have been moving people from Southend Road to Grange Road, Highfield Road and Outwood Common Road. People were provided with food and accommodation at two nearby schools on Thursday night with the assistance of Basildon District Council. Essex Fire Service's assistant divisional officer, Terry Povey, said: "We have four ground monitors on the cylinders cooling them and they will remain in place for the duration of the incident. "The cordon will remain in place for this period. This is in line with national guidelines because when these cylinders explode shrapnel will fly for anything up to 200m." The extent of the exclusion zone will be re-assessed on Friday morning and firefighters are likely to continue cooling down the cylinders until Friday afternoon. Essex Ambulance said crews had treated one man for smoke inhalation and minor burns, who was then taken to Basildon Hospital. Another man who suffered minor burns to his face and a 46-year-old woman with breathing problems were also treated at the scene.